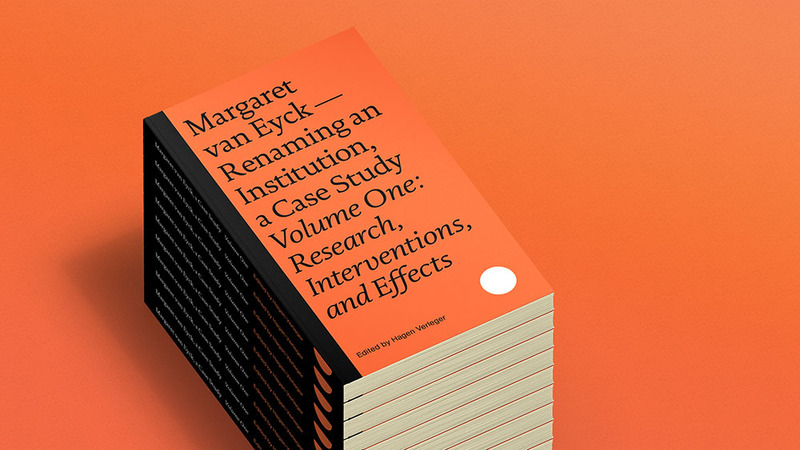 The publication “Margaret van Eyck – Renaming an Institution, a Case Study (Volume One: Research, Interventions, and Effects)” is the first of a two-volume endeavour documenting Margaret van Eyck, an ongoing, collaborative research project at the intersection of feminist intervention, institutional critique, and the politics of (re-)naming, initiated by book designer, editor, and researcher Hagen Verleger during a residency at Van Eyck, Maastricht. For further information and to pre-order, click here, please. 4 ¼ × 7 inches, 184 pages, offset printing (4C/1C), edition of 250, ISBN 978-1-7320534-0-3, published by Peradam, New York.